Whether you like it or not, there’s a lot of curiosity out there for serial killers and snuff films. 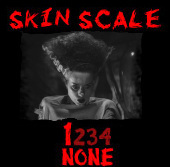 Director Anthony Spadaccini has merged the two and has thrown in a dash of “found footage” aesthetic to craft a trilogy of films centered around a pair of fictional serial killers named Wayne and Andrea Montgomery. 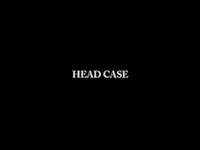 The first film in the series, Head Case, introduces us to the couple’s disturbing and perverse world of murder and mutilation. Wayne Montgomery made a hobby out of killing people and filming his crimes; however, when his wife became pregnant, he decided to settle down and raise his family the right way. Years later, with both children now being teenagers, he confesses that he’s bored. He decides to come out of retirement and pick up where he left off years ago. Along for the ride is his wife, Andrea, who not only helps to film all of the crimes, but also participates in the grisly deeds. Basically just an excuse to appease the gore crowd, Head Case takes a faux-snuff approach that attempts to elicit shocks with little depth. We’ve seen plenty of films operate out of this mode: the seemingly normal, all-American family that houses the dark secrets. I suppose that’s part of the appeal of serial killers--we’re fascinated with just how normal they can appear on the outside. The Montgomery clan isn’t real (though they’re based on Canadian serial killers Paul Bernardo and Karla Homolka), but Spadaccini tries his best to convince you otherwise with his realistic approach. The film is presented as being culled together from the tapes made by the two psychopaths, so there’s a home movie feel to the proceedings. As such, there isn’t much plot to speak of; instead, it’s just some random scenes of violence and post-mortem mutilations that are strung together after a brief introduction to the characters. Sure, we get some insight into Wayne (via his frayed relationship with his overbearing mother), and their two children seem like a typical pair of bickering siblings. But once business really picks up, we’re treated to a virtually plot-less film that quickly grows tiresome. One interesting conflict and sub-plot emerges, but it’s underdeveloped and lost among all of the carnage. Speaking of which, said carnage is pretty admirably-handled, all things considered. There’s a bizarre, nonchalant approach to it, as we only see a couple of actual murders on screen; the rest is dedicated to watching Wayne casually hack the bodies as if they were ingredients being prepared for a meal. 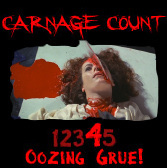 Guts are spilled (literally) and appendages are chopped off, and some of it is quite cringe-worthy. Wayne and Andrea also do a lot of talking about their work, and it’s surprisingly effective. The two share a lot of dialogue where they speak about their murders as if they were any other hobby; it almost plays out as a dark comedy at times when the two bicker about which bathroom is supposed to be used and who’s going to clean up all the mess. Paul McCloskey and Barbara Lessin do a nice job of inhabiting the roles, as it doesn’t feel like you’re watching two actors. Even more impressive is the fact that every scene in the film was improvised rather than scripted, which adds to the authenticity of the experience. And authentic though it may be, the experience does wear on a bit too long, even if the film is technically sound, but not remarkable. The de-saturated look almost makes the film appear to be shot in black and white; it’s probably meant to enhance the home movie film, but it’s a bit drab and dilutes the impact of the film’s signature gore scenes. Those scenes are pretty much all this one has going for it, along with the chilling performances from the leads. The narrative is less than satisfying because it seems to be headed nowhere until the last ten minutes, when it becomes apparent that this one is just a long set-up for the middle entry of the trilogy (entitled The Ritual). From that standpoint, I suppose it did its job because I am morbidly curious to see where it goes from here. Head Case isn’t the most thrilling of films, nor is it anything approaching entertaining, but if you enjoy films of this type, it’s worth a look once it hits DVD. Rent it!